This is an amazing story. It feels so much unlike my teen years that I can almost find it hard to believe and yet it is inspiring and impressive because it all began with a 13 year-old girl and her dream to go to Kenya. And for five years in a row they went bringing school supplies, hygiene kits, etc. to those who needed them. They helped establish a school and were working on buying property to establish a safe house and maybe teaching classes. The building was equipped with an apartment that Riley hopes to make her home someday with her husband Graham. At 14 years old, Riley and her family established a non-profit organization called Generation Next. They established this basically so they could get donations from department stores who wouldn't donate without being able to write it off for a deduction. The non-profit grew into more than they ever expected. 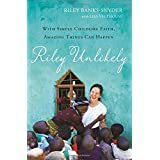 In the middle of this, at age 16, Riley was diagnosed with a medical condition that would prohibit her from having children. She struggled through this for a little while, but once again felt God's call to her for the children of Kenya and threw her energies into it. I'm not going to say much more. Just go read the book. It's a quick read, but very interesting. And challenging. For a young teen to donate so much of her time trying to secure donations and money to help the people in Kenya is just amazing. This book was given me by Book Look Bloggers. I am happy to write a review on it.